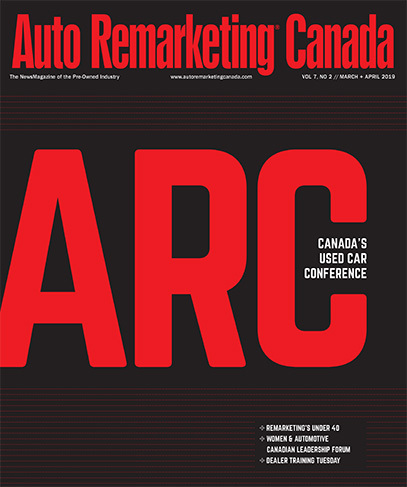 The 2014 Auto Remarketing Canada conference wrapped up on Tuesday evening after two days of networking, innovative workshops, panels and more. With over 600 attendees — more than 40 percent of whom were dealers — the opportunities to make lasting and beneficial business relationships were abundant. On top of an impressive number of dealers, our attendees and speakers included banking executives, auction leaders, consignors, digital marketing experts and more. From Al-Karim Awadia, an account executive from Google Canada’s automotive team, to vAuto’s Dale Pollak and many more, the Auto Remarketing Canada Conference speaker lineup was full of leaders in the automotive industry. The 2014 Auto Remarketing Canada conference's full-to-capacity Expo Hall was a buzzing hive of activity, featuring names such as TRADER Corp., Mobials, Digital Air Strike, Canadian Black Book, and more. In what has become an annual tradition, the 2014 Auto Remarketing Canada conference wrapped up with our Real Sports Bar Event, which was sponsored by ADESA Canada, Apex Inspection Solutions, Auto Remarketing Canada, CarProof, eDealer, Manheim, North Toronto Auction and TradeRev. And the 2014 conference was such a success we already have our dates and location set for 2015. Mark your calendars! The 2015 Auto Remarketing Canada Conference will be held at the Westin Harbour Castle in Toronto on April 20-21, 2015. Were you a 2014 attendee? Keep an eye on your inbox for photos from this year’s event as well as the annual attendee survey.